Christ Church is known for its love of music and is richly blessed with a wonderful choir and other talented musicians who contribute to worship and fellowship. Christ Church also is home base of Jubilate, a much lauded community youth choir. A lifelong member of Christ Church, Deborah Schofield celebrated her 40th anniversary as our organist in September 2008. 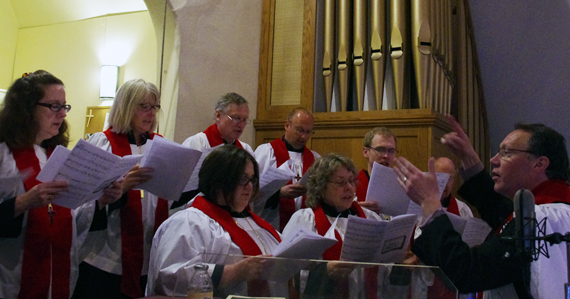 As music director, she chooses our hymns and service music. 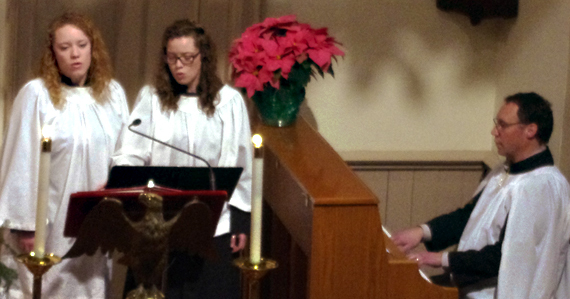 Debbie plays organ or piano for the 9 a.m., 11 a.m. and special services, and accompanies the choir. David Crone is director of choral studies at Monroe-Woodbury High School. He was music director and conductor of the Pro Arte Chorale in NJ from 1997-2010 and has served as conductor for NYSMF, the Community Choral Society, the Riverdale Choral Society, and the Boys Choir of Harlem. In 2009 he made his European conducting debut as part of the Liverpool Capital of Culture Festival, followed by a performance at Liverpool’s Anglican Cathedral. David holds a doctorate from Seton Hall University, a master’s in conducting from Temple University and a B.A. in jazz composition from Berklee College of Music. His passion for performing extends into the jazz community with regular appearances as a jazz pianist. He is often a guest conductor, accompanist and clinician at choral festivals and conference throughout the tristate area. David, wife Lucia, and their four children are frequent contributors to Christ Church music in the choir, as soloists, and as instrumentalists. 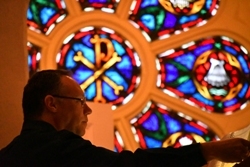 David is also a composer, and his uplifting “Mass of the Living Christ” is a highlight of Easter season. In 1992 our new pipe organ was built by the Peragallo Organ Company of Paterson, N.J. It contains eleven ranks of pipe work and 726 speaking pipes. The new organ project, fund-raising, and continued care fund were lovingly spearheaded by Donald R. McFarland. Christ Church is well blessed with talented musicians. Our choir is SATB and performs at the 11 a.m Sunday service (September to June), holy days, and special events. Rehearsal is at 10:10 a.m. Sundays. To inquire about auditioning for the choir, see David Crone after the 11a.m. Sunday service. Congregants who are talented instrumentalists and wish to perform a sacred or appropriate piece during a worship service are invited to speak to Debbie Schofield after Sunday services. Jubilate is a community youth choir that was founded by Father Scott Barker, David Crone and Anne Barker in 2006. With a steering committee of Christ Church members and funding by Christ Church, a 12-member treble choir performed for Bishop Sisk’s visit that December. The choir has flourished and now has members from several towns, consists of several different voice choirs, and performed at Carnegie Hall. It has won numerous awards in competitions. Jubilate’s liturgical choir performs frequently at Christ Church. For more about the choir visit the Jubilate web site.